You need an award winning legal team. When you have a complex legal problem you need smart, sophisticated and practical lawyers on your side. Shustak Reynolds & Partners, P.C., is a specialty law firm with a national practice focused on securities and business law, financial services law and business and securities litigation and arbitration. Our offices in San Diego, Irvine, Los Angeles, San Francisco and New York City allow our firm to represent clients locally and throughout the country. We limit our representation to a select number of cases and clients. Our clients include domestic and foreign publicly traded corporations, broker-dealers, financial advisors, stock brokers and registered representatives, registered investment advisor firms and investment advisors, financial planners, banks, insurance companies, Fortune 500 companies, manufacturing firms, venture capital firms, hedge funds, investment partnerships, high net worth families and individuals, entrepreneurs and investors. Counseled and advised a variety of businesses, small and large, public and private, in a variety of matters including contracts and employment law; internal investigations; corporate governance and many other, day to day legal issues. Our firm’s San Diego, Irvine, San Francisco and New York securities litigation and arbitration lawyers are experienced and knowledgeable in state and federal securities laws and routinely handle arbitrations and litigations in state and federal courts as well as before securities self-regulatory organizations and arbitration forums across the country in disputes involving securities law issues. We have extensive experience in arbitrating securities related disputes for broker-dealers, registered representatives, investors, investment advisors and various businesses before FINRA (the Financial Industry Regulatory Authority, formerly known as the NASD); the American Arbitration Association (AAA), JAMS, the National Futures Association, the International Chamber of Commerce and other arbitration tribunals throughout the United States and abroad. Our firm, and our experienced financial services attorneys, have handled hundreds of FINRA arbitrations for broker-dealers, registered representatives, financial planners, investment advisers and registered investment advisory firms. 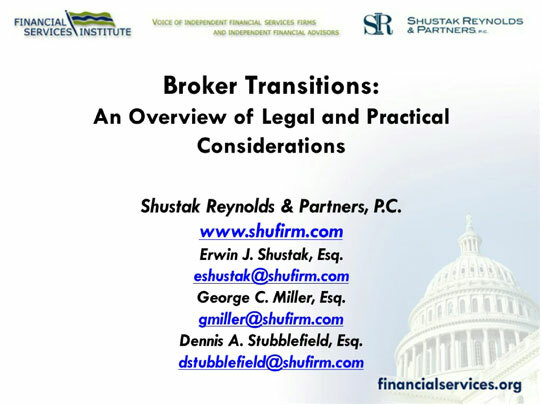 Listen to the Webinar our firm created for the Financial Services Institute on "Broker Transitions: An Overview of Legal and Practical Considerations". This Webinar is critical to brokers considering a transition to another firm and recruiters who routinely deal with brokers in transition. 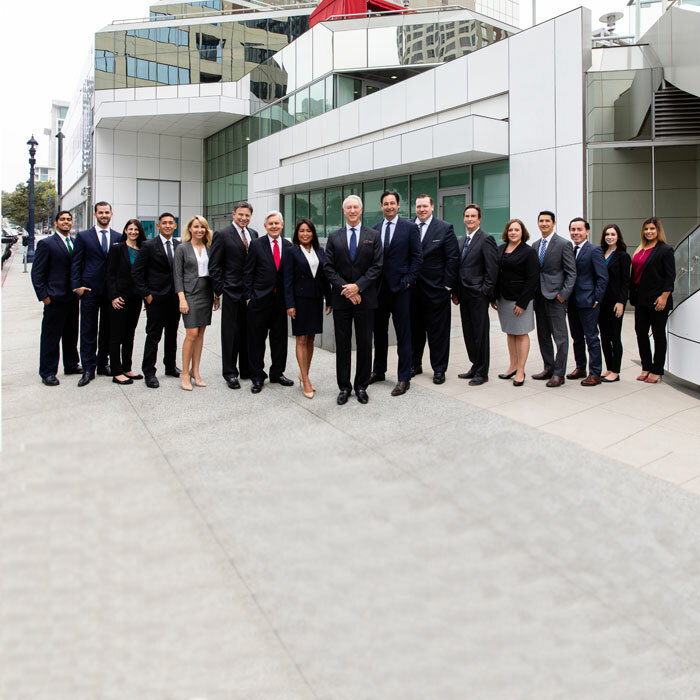 Shustak Reynolds & Partners' Litigation and Arbitration Practice Group is comprised of experienced San Diego, Irvine, San Francisco and New York business dispute lawyers with hundreds of years of combined experience. Our nationwide litigation and arbitration practice handles complex litigation, arbitrations and trials in federal and state courts, and alternative dispute arbitration forums, in California, New York and throughout the country. While results vary depending on the facts of the case, we have helped past clients save many millions of dollars as well as recover large losses. Minority shareholder "squeeze-outs" and "freeze-outs"
Contact our San Diego, Irvine, San Francisco business dispute lawyers today and have us analyze your situation and case. Our boutique-style law firm stands out for its ability to handle the most involved legal matters while still providing our clients with close, personal service. The high quality of attention and creative approach we offer allows us to attend to our clients' business needs while remaining very cost-competitive and thorough in our legal representation. Shustak Reynolds & Partners' Corporate and Securities Transactions Practice Group consists of experienced and skilled San Diego, Irvine, San Francisco and New York corporate and securities lawyers. Our corporate and securities transactions attorneys represent a broad spectrum of companies at every stage of corporate existence, from formation through sale or merger of the company. The firm's integrated approach encompasses analysis of shareholder relations, risk management and intellectual property protection, among other things, to help foster an optimal environment for the client's business to prosper.